Doll houses evoke memories of childhood, and offer a momentary escape into a perfect miniature world. 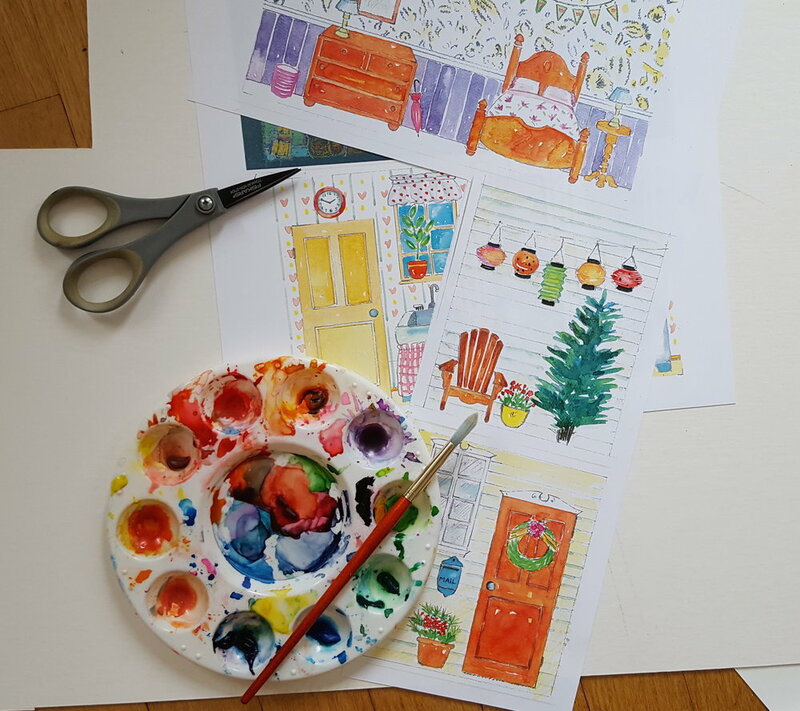 The photos document the process of designing a doll house book from the initial pencil sketches to the finished watercolors and pastels, and finally the finished printed book. The book becomes three dimensiolanal, with four little rooms, when it is opened up. There is something intrinsically appealing about objects that are either smaller or larger than they are in reality. A sculpture, of a giant ice cream cone by Claes Oldenberg, mounted on the roof of a mall in Cologne, Germany is an example of the small made large. Although I have not seen it in person, photos make it seem as though the ice cream cone is melting and could wind up in the street at any moment. The notion that the sculpture might only be discovered if a passerby happens to look skyward, to check for rain clouds, adds to the sense of surprise. Objects that are miniaturized also cause us to take a second look and engender a smile. Matchbox cars and tiny tea sets are designed to be played with by tiny hands, but beyond the practical these items are appealing also to adults. As a child I adored The Borrowers series by Mary Norton about a family of tiny people who live secretly in an English house and "borrow" from the inhabitants. What fun to be able to use a spool of thread as a stool or a matchbox as a dresser drawer. As an adult, reading the series to my son, I was equally enchanted. Two rooms in my house are illustrated with watercolor, and two are done in pastel. I used my own textile designs for two of the rugs. The Adirondack chair on the back is the one that is on my patio, and the Japanese lanterns are reminiscent of the ones my mom hung for my fifth birthday party.